Which Country Is the Best In the World? Online portals and magazines are usually filled with top lists of anything that can come to your mind. The top 10 world destinations, the most interesting games, the most watched movies and the most popular books, the most popular applications etc. Thus, every year a list of the best countries in the world is being made. Very serious institutions are engaged in research to find out in which countries people live best. After one of such surveys, the declared number one country in the world to live is Switzerland. The research was published by U.S. News in cooperation with the World Report, involving 80 countries and 20,000 respondents. Each country is rated according to 9 different categories, such as heritage, promotion opportunities, entrepreneurial freedom, cultural influence, quality of life and business opportunities. According to many different surveys, Switzerland has been the first choice for a country to live in, but also to keep the money in. Even though this is a land of mountain lakes and snow peaks, purple cows, world’s most famous chocolates and delicious cheeses, watches and banks, there is certainly a deeper secret behind the magical attraction of this Alpine beauty. Some experts believe that Switzerland became a state of well-being precisely because of its mostly peacetime history during which the country always managed to maintain the neutrality during the wars, but also its independence and sovereignty from external forces. Switzerland hasn’t participated in any war ever since 1515. At the same time, it has always been open to healthy co-operation with other countries and nations. Switzerland is a Central European country known for its diverse ethnic structure, efficient federal arrangement, economic development and a high standard of living. Switzerland’s strong and stable economy has made it a dream country for investors from around the world. This country has one of the most prolific and innovative ecosystems in the world. It attracts the most talented people from various areas and encourages the cooperation of the academic and the business world, which consequently leads to the expansion of innovative products. Most important decisions, however, are made at local levels. Switzerland, unlike most European countries, has no massive bureaucracy, and the will of the voters has an enormous influence. The largest food company in the world is Nestlé, and Switzerland is the leading consumer of chocolate. On average, a Swiss citizen annually eats around 23kg of chocolate. Perhaps this is also one of the reasons why research has been confirming for years that the happiest people in the world live precisely here. If you prefer dairy products, it is useful to know that Switzerland is one of the most famous producers of quality and tasty cheeses. For winter sports and snow lovers, Switzerland represents a real paradise. Over 70% of the country is mountainous, and as many as 74 of those mountains have peaks above 4000m. It is thought that skiing was brought to Switzerland by Sir Arthur Conan Doyle, the author of the novel about Sherlock Holmes. Hiking and trekking mountain slopes will take you to the hidden natural pearls or to one of as many as 1500 crystal clear lakes. Switzerland is also the country of watches and banks. On every 1,600 Swiss citizens comes one bank where most of the world's treasure is kept. 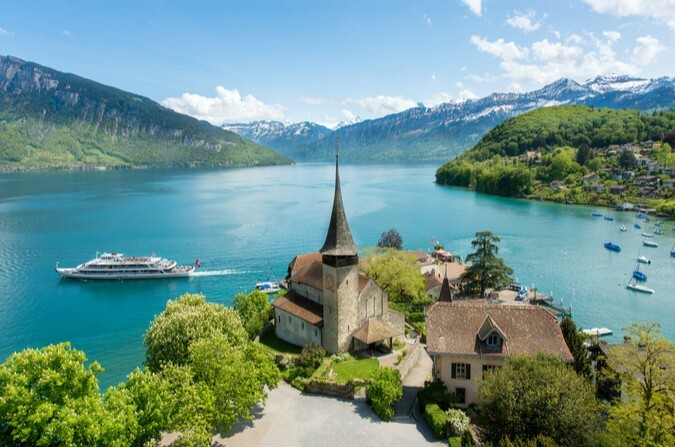 If you wish to visit Switzerland using public transport, you can do so with one card only, using all the available means of transport - bus, train, lift or boat. After all, it is not surprising at all that the Swiss have the longest lifespan, immediately after the Japanese. Switzerland could certainly serve as a successful model and guideline for all the other countries that want their people to live in abundance and prosperity.